Invariably holidays revolve around food, wine and more food, so here are my recommendations from our much-needed January trip to South Africa. We left Heathrow after a pretty tasty bowl of super noodles, sat on a lengthy 11 hour flight and touched down in Cape Town, South Africa to start our two week break. We picked up the car (where we got a free, yes free, upgrade), headed to our first guesthouse, dropped off our bags and went straight to Steenberg in Constantia – the first place we’d visited on our first tour of South Africa. Steenberg is a wine farm with a fab restaurant attached to it – Bistro 1682. After a few glasses of their very nice sparking Sauvignon Blanc, I had oysters followed by a courgette risotto whilst Krystal, my wife, had tuna with an Asian salad. With a little room for more, we shared a tasty strawberry cheesecake before heading out for a walk around their beautiful vineyard. For dinner we headed to yet another wine farm, Buitenverwatching, which is worth a visit for the wine – we had a delicious red, 2010 Christina – but not for the food, which was a bit clunky. Our private guesthouse in Constantia was excellent and run by a Dutch couple who looked after us as if we were in their own home. We were treated to a breakfast of pastries, cold meats and fresh fruit in the blissful morning sun, before heading off for another day of wine tasting. We kicked off at Constantia Uitsig, who do a nice 2013 Chardonnay Reserve but whose farm was pretty average in comparison to the others, then moved on to Klein Constantia. We loved Klein Constantia, thoroughly recommend it and stocked up on their house-smoked salt. Groot Constantia looked too busy and commercial with tourist busses everywhere, so we missed it out. After a day of wine tasting, we headed back to the guesthouse, sat by the pool and had a platter of cold meats, biltong and cheese, including a brilliant, aged Gouda and sour dough with fresh figs straight from the garden. For dinner, we took up a recommendation to visit the Harbour House restaurant on Kalk Bay, about 40 min from Constantia. The bouillabaisse and seafood platter were really enjoyably but looking back, the best was still to come. After two nights in Constantia we headed off to Stellenbosch, a town 50 km east of Cape Town along the banks of the Eerste River – the second oldest European city in the province after Cape Town – where we checked into our ‘treat-hotel’ of the holiday on the Delaire Graff Estate. One of my favourite memories from this hotel was the artwork, mainly by South African artist Lionel Smit. I don’t pretend to know anything about art, but I know what I like and I loved this. The hotel had a great Asian restaurant, where for lunch we enjoyed yellow tail sashimi, duck pad thai and an Asian salmon salad with a glass of Delaire Graff Estate Rose on the restaurant terrace. The day took a disappointing turn when we went for a wine tasting; the wines were very expensive and generally poor value for money, particularly compared to others we’d tried. I suspect the name attracts customers, not the wine itself! After a few hours of sun and views of the Delaire Graff Estate by the pool, we went for dinner in the hotel bistro (yes, more food!). Whilst expensive in comparison to other meals we had, we had an excellent dinner: I reverted to oysters, followed by duck with polenta and Krystal had springbok. All of it was just delicious, even the amuse bouche of beetroot-cured salmon and avocado. We also enjoyed the best wine of the trip, a fabulous 2007 ‘Three Pines’ Cabernet Sauvignon by Stark-Conde from Jonkershoek Valley, Stellenbosch. Absolutely first class! All in all, it was a lovely setting, very relaxed with great service. After an amazing breakfast the following morning – including marinated pineapple with clove, cardamom, star anise and cinnamon with yoghurt (delicious) – we headed off to see some vineyards in Stellenbosh. We started at Peter Falke and, despite trying a few wines, our favourite was a 2012 Syrah. We had a lunch of ciabatta, lentils with parsley and olive oil. It just goes to show that even the very simplest of meals can be some of the most enjoyable. Then we went on to Alto, a very small vineyard producing some excellent wines, just down the road. The Shiraz was particularly good and incredibly reasonable; unfortunately, they don’t export their wines. I guess they keep the good stuff for themselves. Last but not least we visited Bilton Wines in Stellenbosh, for a ‘wine and chocolate’ tasting. The wine was pretty good – combined with the chocolate, it was amazing. Stocked up for gifts! After a night in Stellenbosch, we made our way to Franschhoek and we kicked off the day with a vineyard stop-off (best way to start the day) at La Bourgogne, a really small vineyard close to the town. I can’t recommend it enough; it’s a fab find with some first class wines, a highlight being a 2013 Malbec. Again they don’t export, not because they don’t want to, but because they’re not allowed. As the name suggests, the farm has French heritage and there’s a ban on all exports as the French attempt to protect their own brand (and wine sales). La Bourgogne also has endless olive trees from which they produce their own olives and oils, which we of course sampled. We then headed to La Petite Ferme, one of our fondest memories from our previous trip to South Africa. For those who haven’t been to La Petite Ferme, it’s positioned at the end of Franschhoek, elevated over the town with great views of the valley and the surrounding wine farms. I couldn’t remember having a brilliant meal there previously, but the great experience remained clear. Needless to say, we were excited to go back. Overall we didn’t have a bad meal or experience, but it wasn’t special by any means. The service was ok, food pretty good but it just lacked that ‘special touch’. I had duck liver pate to start, which in fairness was great, and a main of rabbit and polenta, which was also pretty good but it was followed by a poor creme brûlée which, made well, is my favourite dessert. Krystal didn’t have a starter, but she had a really odd peanut stuffed chicken leg (bad choice) which was like eating chicken dipped in uncooked peanut butter. Food aside, the wine was good and the setting was as I remembered. After lunch we went to Lynx Wines which was one of our favourite wine farms from our previous trip. We loved it so much in fact that we had their 2012 Shiraz at our wedding in September. A small, back-to-basics private vineyard, taking a ‘spit and sawdust’ approach to wine production – or at least it was. It had changed. They had a new tasting area which was spotlessly clean and polished, corporate posters and branded pop-ups, they even had branded polo shirts. So many of the things we loved about it had changed. Our memories were of the owner and his dog running in from the vineyard to do a tasting with us, the disorganised and cluttered tasting table and the personal tour of the fruit-fly infested open tanks they use to produce wine. Time was no issue; if we had a question he’d be happy to help and he was proud to tell you how he made this great wine. This time we were rushed in and out by a lady who quite frankly wasn’t that interested. Then it came to the tasting, which of course wasn’t as good as before. I’ve come to the conclusion that the environment and experience are just as important as the taste of the wine and we left feeling disappointed. Like La Petite Ferme, great memories are perhaps best left as memories. We had been recommended a farm called Babylonstoren near Franschhoek by a few people, so we had to visit. We’d heard of their amazing gardens, farm shop, bakery, vineyards and a very good restaurant, which we tried booking weeks before and they were full. The farm did not disappoint and it was without a doubt one of the highlights of the trip. I’ve never seen gardens like it; each unique area was bursting with tropical fruit, fresh vegetables and salads. 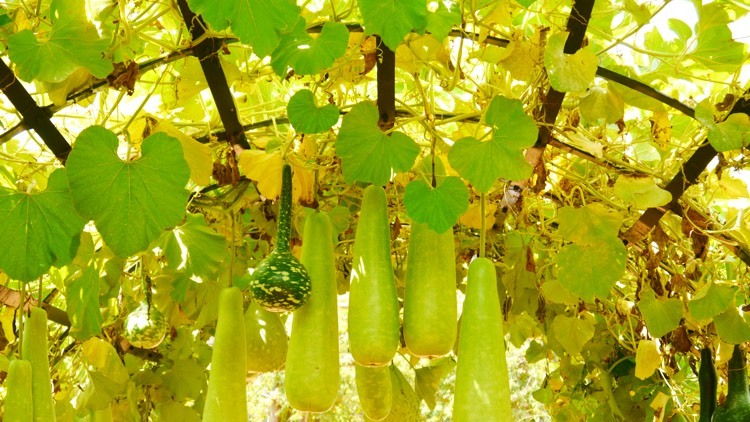 The squash tunnel will be a lasting memory – huge, hanging peardrop-shape pumpkins trained to grow over a large wire tunnel. The farm shop was also incredible and bursting with treats: biltong, fresh baked bread (whole pear and stilton looked amazing), homemade jams, local cheeses, cured meats…the list goes on. We could not have left without buying some bits, so we got some biltong, local cheese and freshly-baked bread which they bake on site. Dinner sorted! We headed off to lunch at Grande Provence, which was next to our hotel in Franschhoek. We’ve both agreed that this was our best meal of our holiday (closely followed by the Pot Luck Club, which I’ll come on to). We had a table booked outside in the shady courtyard where there was maybe six or seven tables set up for lunch. It was absolutely stunning and the weather was perfect. We had such a great meal as well. They served the most amazing soda bread with homemade butter – it had pumpkin seeds coasting the crust and was absolutely delicious – I could have filled up on bread. For starter, I had asparagus mousse with truffled pea croquette and almonds, followed by sea trout with soft-shell crab, finishing up with honey ice-cream served with honeycomb and waffle. Krystal’s dessert was the highlight (I’m surprised she let me taste it), it was a raspberry macaroon with lemon sorbet and white chocolate. I can’t recommend a visit strongly enough! I also had a couple glasses of the Grande Provence Sauvignon Blanc, but we didn’t do a formal wine tasting there. We will next time! That afternoon, I managed to drag Mrs Houston around a golf course, Pearl Valley, close to Franschhoek. It’s a lovely course and not too challenging, which was great having had a few glasses of wine at lunch. Six lost balls later, four hours of burning sun and three miles was walking, I was ready for a cold beer. After a few amazing days in Franchhoek, we chose to spend the rest of our holiday at Camps Bay, close to Cape Town. In contrast to our wine tours, endless eating and general indulgence, we didn’t have a lot planned for Camps Bay, giving Mrs Houston valuable sun-basking opportunities. On our way there we stopped at a few vineyards; Vergelegen, which Wendy recommended, and another called Stark-Conde, both close to the Stellenbosch area. We really wanted to go to Stark-Conde as we had some of their wine at the Delaire Graff restaurant and they did not disappoint. We had a wine tasting on the edge of the lake on the Oude Nektar Farm, where Stark-Conde is based. Again we tried the ‘Three Pines’ Cabernet Sauvignon which was as good as we remembered. Well worth a visit. We then waved goodbye to Franschhoek and Stellenbosh and made our way on to Camps Bay. Having climbed the infamous Table Mountain a few years ago, it was time to tackle its little brother, Lion’s Head. It’s a deceptively tricky two-hour walk (climb in parts), but well worth the sweat and sunburn when you hit the top – the 360 degree views over Cape Town and Camps Bay are breath-taking. We met a group of friends for a late lunch at Umi, a smart Asian restaurant in the centre of Camps Bay. If you like fresh fish, sushi and sashimi, then it’s a great place to visit. Another absolute highlight from our trip was The Pot Luck Club in The Old Biscuit Mill in downtown Cape Town. I said earlier that the Grande Provence was our favourite. Well, The Pot Luck Club came a very close second, but it was a very different experience. The restaurant is on the top floor of what is essentially a warehouse building overlooking the city. For those who have been to The Clove Club in London, it was very similar in design and general feel and despite the unrefined exterior you know this place means business. They had a help-yourself Bloody Mary bar, which I got stuck into and Mrs Houston enjoyed the fizz. The excellent food just kept coming and whilst I don’t want to describe the style of food as tapas, four tasters for each course were served on large boards in a tapas style. Our starter was awesome: omelette Arnold Bennett, oysters, smoked salmon and horseradish cannelloni, and mushrooms on toast. Mains included duck, fish tacos, tuna tartar and pork belly (we added on the crayfish as an extra), followed by desserts of churros, pop corn shake and strawberries with sherbet. It sounds like a lot of food, and it was! The presentation was modern, it was interesting and most importantly, the flavours of each dish were spot on. You’ll need to think ahead if you want to go (and book early), you will not regret it – it’s an experience not to forget! On our penultimate day, I was allowed to indulge in one of my loves, cars. Last time we came to South Africa, we saw an AC Cobra on Chapman’s Peak and I said to Krystal then: “next time we come, I’m hiring one of those and we’re driving around Cape Point.”. Well, she let me! For those of you into cars, you’ll remember the scene at the end of Bad Boys where they’re racing down the runway in an AC Cobra and a 911. Since a kid, the AC Cobra has been one of my dream cars and for one day only, I was able to pretend I owned one (at least a replica). A fantastic end to a brilliant holiday, driving along the coastal roads, through national parks and down to Cape Point, where we spent a few hours walking up to the viewing point (unfortunately amongst the other tourists). If you manage to get out there and visit and taste any of these, I’d love to hear what you think.